The first nine days in the Ashwin month is celebrated differently in different parts of India by Hindus. In Gujarat, the Navratri period is noted for worship of Mother Goddess, puja, rituals, fasting and above all the dandiya raas or garba dance, which continue till late night during the period. The dance is also referred as ‘stick dance’ due to the rhythmical striking of dandiyas during the dance. In 2018, Navratri in Gujarat begins on October 10 and ends on October 17. Navratri in Gujarat is not just dancing alone; there is religious worship of Shakti, referred as Mother or Mataji. People visit shrines and there is the special worship of Goddess Shakti at home. The worship of Mother Goddess is performed by lighting an earthen pot filled with holes. Numerous pujas and rituals also take place during the nine-day period, which begins on the first day of Gujarati month Ashwin. Nine aspects of Durga is worshipped during the period and women wear nine different colors of Sarees or dress. Nine different colours symbolically represent the nine different aspects of Mother Goddess. The most important ritual during Navratri in Gujarat is the sowing of barley on a mud bed on the first day of Navratri. The barley seeds will become shoots and attain around 3-inch length by the tenth day (Vijaya Dashami) and it is distributed among friends and relatives. 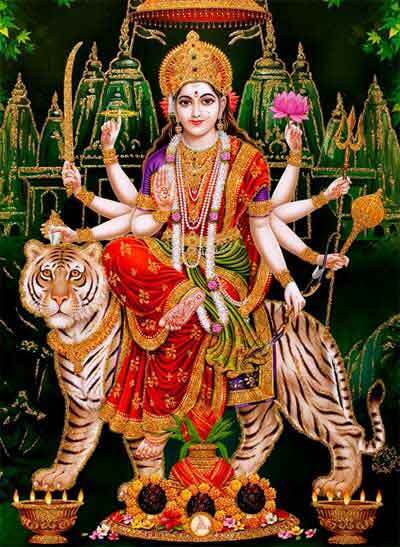 The first three days of Navratri in Gujarat is dedicated to Goddess Durga. Kumari, Parvati and Kali forms of Durga are worshipped on the first three days. Next three days, from fourth to sixth day, is dedicated to Goddess Lakshmi. On the fifth day, there is special puja dedicated to Goddess Saraswati and is known as Lalita Panchami. Display of books and other literature and special prayers are offered to Goddess of learning, Saraswati. The last three days are dedicated to Goddess Saraswathi. Prayers and pujas are performed to attain wisdom. On the eight day of the festival, that is the Ashtami day, Ghee (clarified butter), kheer (rice pudding) and sesame seeds are offered to Goddess Durga and a Yagna is performed. On ninth day, which is the Maha Navami Puja day, Kanya Puja is performed – worship of nine young girls representing the nine forms of Goddess Durga. The nine-day Navratri puja ends with this ritual. The 10th day is the Vijayadashami day and it celebrates the victory of Ram over Ravan and Goddess Durga over Mahisha. The worship of Mother Goddess during Garba is performed by lighting an earthen pot filled with holes. The light from the holes symbolically represents the Goddess. The Garba Dance is also held in front of an image of Goddess and around the illuminated earthen pot. The word Garba comes from the earthen pot, which is lit and kept in every house during the Navratri period. In the beginning, the pot was lit on the first night of Navratri and family members used to dance around it and it was purely a family affair. Nowadays, it has become a social and community activity and Navratri in Gujarat is today famous for the Dandiya Ras or Garba Dance competitions. The Dandiya Raas takes place around the Garbo pot. The Chaniya Choli, the colorful dress, worn by women is another highlight of the dance. Men wear the traditional Dhoti Kurta. The accompanying music is provided by a drummer and a singer. The striking of the stick in unison also creates a unique musical effect. The dance begins on a slow pace and gradually gains momentum with the fast drumming in the background. The dance reaches its zenith and then suddenly there is a pause. The sequence is repeated again. Today, the Garba performance is a professional affair and groups begin preparations in advance. In cities, traditional music at times gives way to fast Bollywood numbers. From the first night of Navratri, costumed boys and girls, men and women, appear in community pujas, stages, schools, clubs etc and join in the Navratri Dandiya dance festival. Millions of other devotees pray and fast to evoke the blessings of Goddess. 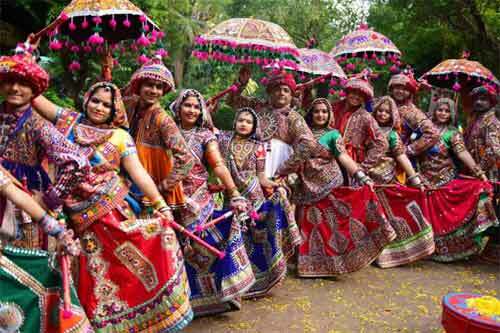 This perfect amalgamation of mirth and spirituality makes Navratri in Gujarat an unparalleled event. Navratri Fast in Gujarat is slightly different from other regions. Here is a brief idea on how fasting is observed during Navratri. The fast is observed during Chaitra Navratri (March – April) and also during the Saran Navratri (September – October). It is a partial fast on all nine days. Special food devoid of onion and garlic are prepared during the period. The food that is eaten during Navratri is prepared on the day after bathing and performing pujas. Rotis made of Kuttu, or Singhare ka Atta, is widely eaten during the period. Potatoes, cucumber, pumpkin and shakarkandi (Pink colored sweet potato) are widely used to prepare dishes during the period. Spices are generally avoided. But some people use it mildly. Rock salt is preferred in all cooking. Milk products are recommended during the period therefore dishes made using paneer, curd and sweets from milk are widely consumed. All types of fruits are also consumed during the period. Food made using garlic and onions are strictly avoided during Navratri. All types of non-vegetarian food and alcohol should be avoided by those people undertaking Navratri Vrat.